PSNI have been granted an extra 48 hours to question Gerry Adams over the murder and abduction of Jean McConville. Sinn Fein MLA Gerry Kelly has reacted angrily to the news. He said: “The arrest and continued detention of Gerry Adams is deliberately timed to coincide with the elections in three weeks time. “This is political policing at its most blatant. Sinn Fein support for the police appears under threat as detectives continued to quiz Adams about the murder of the mother-of-10. Martin McGuinness warned that the party will “reflect” on its support for the PSNI if Gerry Adams is charged with any offences arising out of his arrest on Wednesday by officers investigating the 1972 murder. The Stormont Deputy First Minister and Sinn Fein veteran said he and colleagues would not be making a “knee-jerk” decision. 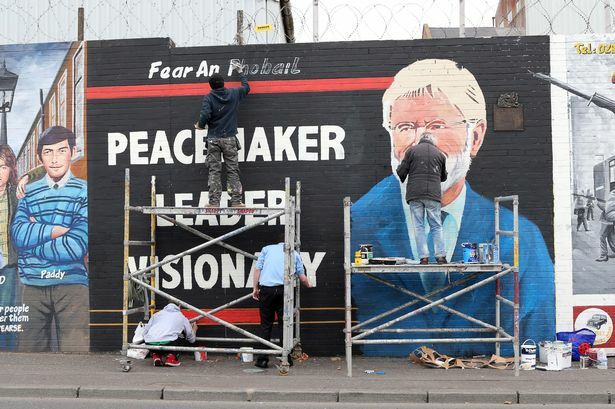 And he raised the spectre of what would be a huge blow to the peace process in the region as he said it was his understanding police were applying to a judge to extend the period of time they can question Mr Adams at Antrim police station. With the initial 48-hour deadline looming for officers to either charge or release Mr Adams after his arrest on Wednesday night, the PSNI applied for an extension, the Deputy First Minister confirmed. Adams, 65, vehemently denies allegations levelled by former republican colleagues that he ordered Mrs McConville’s murder and secret burial in 1972.